Hello again everyone, and welcome to Banting House National Historic Site of Canada. Can I interest you in a guided tour of the museum? 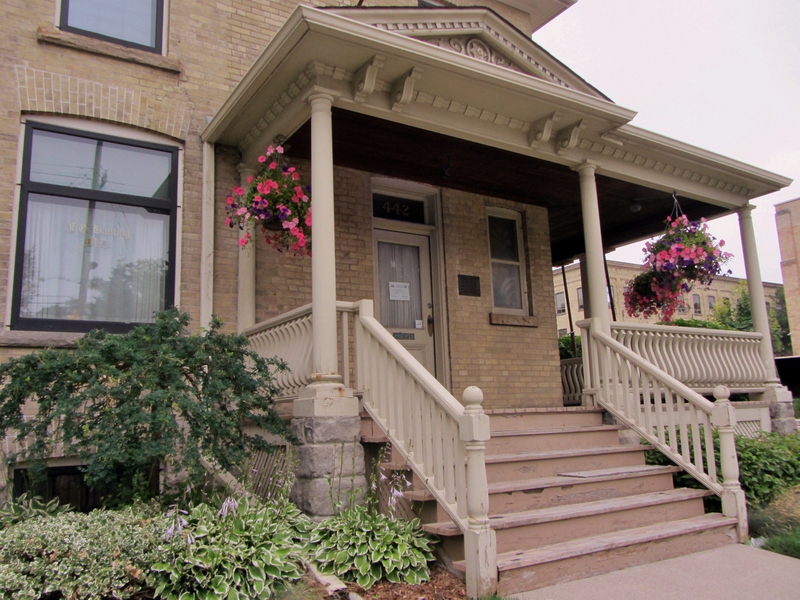 Guided tours are one of the most important things we offer at Banting House. While I am enjoying the process of learning how to be a great tour guide, I am finding that there’s a lot of practice that goes into making it look easy. New staff at Banting House become acquainted with the museum in a variety of ways. On my first shift, the curator, Grant Maltman, gave me a one-on-one tour. This was the perfect way to be introduced to Banting House, since he knows it better than anyone. I was then given a manual that lists the important points about each gallery. A couple hours and lots of highlighter ink later, I returned to the galleries to tour them on my own. Finally, I’ve been shadowing museum volunteers and taking notes when they give tours. It was very helpful to get different perspectives on the collections and to hear the kinds of questions visitors ask. If you were touring with us last week, thank you for letting me follow you around. So what can you expect from the tour when you visit Banting House? Good question. We start by telling you a little bit about the creation of the museum and its designation as a National Historic Site of Canada. Then we spend some time in a temporary exhibit (right now, a display of very powerful and moving letters written to Dr. Banting). You’ll learn about Banting’s involvement in the First World War, his arrival in London and his beginnings as a practicing doctor all before moving upstairs. On the second floor we tell you about the Second World War, other medical projects Banting contributed to, Banting’s art, and the story behind insulin. All of this takes place surrounded by items that Banting really owned, in the house that he really lived in. Although there’s a basic structure behind every tour, the amount of information we can offer within that structure ensures that no two visits to Banting House are the same. All our tours, of course, tell the story of the discovery of insulin. As we give tours, however, we try to make it personalized – if you love military history, we’ll tell you all about Banting’s military accomplishments, and if you love art history, we’ll draw your attention to Banting’s relationship with the Group of Seven. If you’re interested in local history, we have plenty of London stories, too. We encourage you to give input and ask questions throughout the tour. This makes it great for visitors, since every time you come to Banting House you’re bound to learn something new! Speaking of learning new things: I’m finding that this job is educating me in more ways than one. I’m learning not only about becoming a tour guide, but about the impact that Banting’s work has made on millions of people. As someone who has insulin-dependent relatives, these messages hit close to home. When you come to Banting House, be prepared to be moved by the stories of people living with diabetes. I’m looking forward to seeing you at Banting House. I can’t wait to show you around! Posted in Behind the Scenes at Banting House.Tagged Banting, Dear Dr. Banting, Exhibit, Exhibits, Museums, tours, volunteer, Volunteers.